The book The Construction of Mathematics: The Human Mind’s Greatest Achievement includes creation of tables of the logarithm function by the Swiss craftsman, engineer, and mathematician Jost Bürgi around 1600 CE, with delayed publication in 1620. The book includes the title page of Bürgi’s tables, then explains that the black numbers of the inner ring are on a logarithmic scale. Due to that feature, two copies of that ring of numbers can be arranged in nested fashion depict a circular slide rule. Bürgi did not realize this, or rather, there is no evidence that he did. Instead, William Oughtred invented the circular slide rule two years later, in 1622. We couldn’t rest until we had implemented the circular slide rule based on Bürgi’s title page. For an authentic look, we created with Photoshop two differently sized copies of the black ring of numbers of Bürgi’s title page. The resulting rings were encased in Lexan and connected by a center bolt. 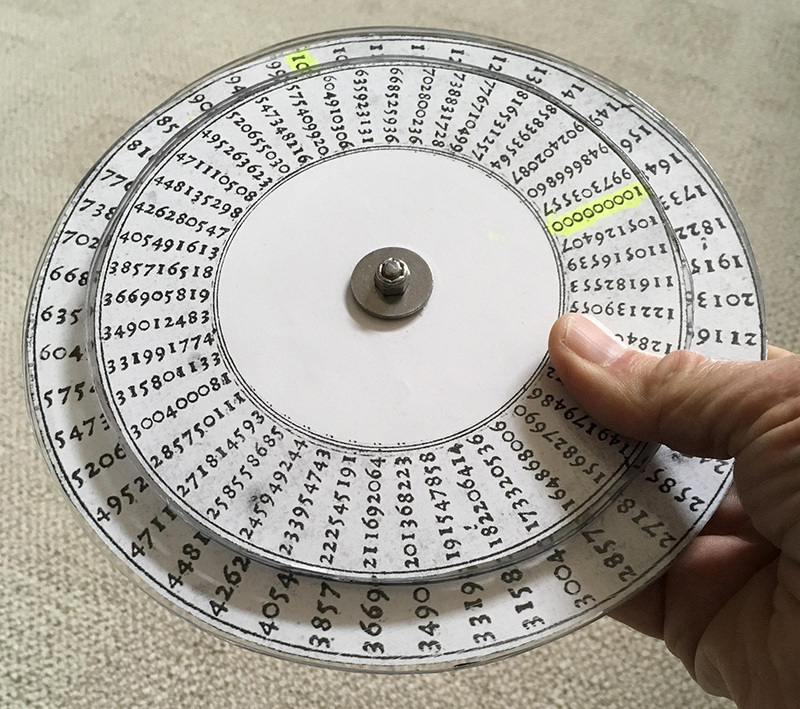 It is fun to multiply and divide numbers by rotating the inner, smaller disk, all the time thinking that this is based on the work of genius done almost 400 years ago.